Airchair Caddy is a Hit! We bought this airchair caddy for my 73 year old mother...who has two bad knees and spends quite a bit of time in her recliner. This caddy has been perfect...it holds her hot tea on the sturdy top the side pockets hold her remote to the tv, the home phone, her cell phone, her reading glasses, a small packet of tissues, her hand lotion, pens and pencils and a notepad, toenail clippers...just about everything! She has it filled to the brim LOL She couldn't be happier to have all of her necessities...right at her fingertips :) Great product! I'm going to purchase another one for my father0-in-law...who keeps flashlights, screwdrivers, shoehorn, reading glasses, crossword puzzles and who knows what else next to his recliner!! I use it on my recliner rocker chair. I have a lot of remotes in a caddy and other items near the chair on a table. The remote caddy was full and things kept dropping to the floor. This will hold all the items and a little room for growth. The pockets drape nicely over the chair arms and the top border keeps things in present use from falling off. Practical and Attractive. I have it on my living room love seat and it looks wonderful. and can put all his things he needs close by. Keeps articles close by when needed. Ordered this for my Daddy over a year ago. He LOVED it! Sadly, my Daddy passed away in February - but, it still sits on "his" chair. It was very useful for him - kept his wipes, remote control, small calendar and more in hands reach for him. Bought this for my hubby to put on his chair, now things like the loose change, TV controls, his glasses, his phone no longer slide down between the cushion and the chair. Makes for better evening. This was one of several small gifts for my picky son. He loves it and said "now I don't ever have to leave my chair during a football game!". So...well done! Makes everything easy to reach. I had an injury and had to keep my leg elevated. This fit perfectly on the arm of my recliner chair. It hold my TV remoter, phone. and water. It's perfect for me!! Are use it on the arms of my sofa to hold my remote controls, the books to my TV, stereo DVD player etc. and also my Reading glasses and other items I may one close by while watching TV...it is priceless to me! The Arm Caddy is just perfect. When you come home from work and don't want to be trying to remember ...Now, where did I leave the T.V. Remote Control? 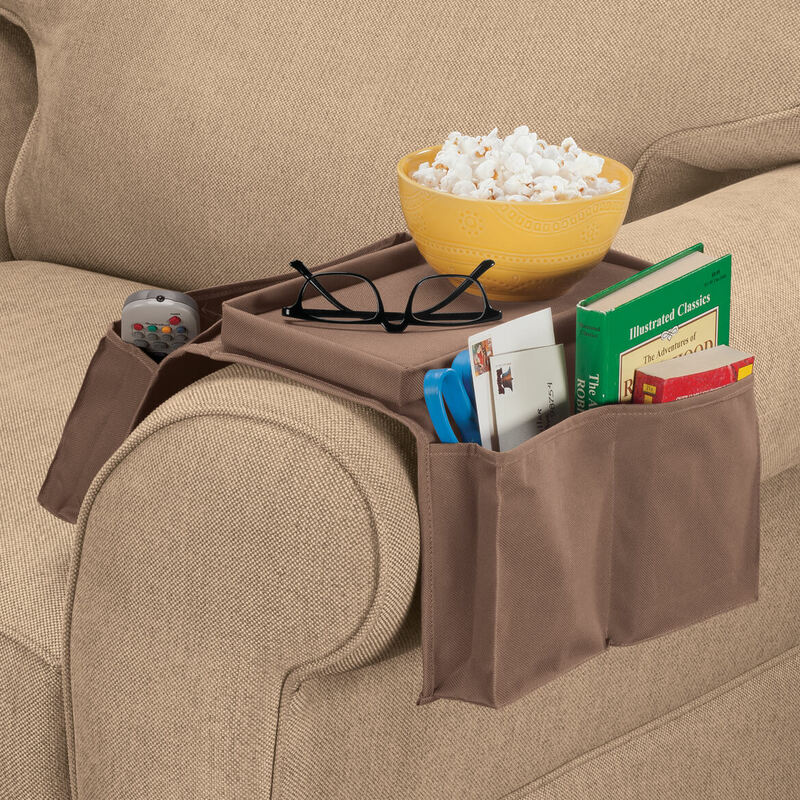 The Arm Caddy has several Pocket Sleeves to hold up to 4 Remote Controls all at a touch. There is a Section to hold the Mail of the day as well, plus it has a handy tray on top which you can use to put your favorite beverage to sip on as you watch your favorite T.V. Show or Movie. It's perfect for the armrest of your favorite Recliner Chair for it has a tight spring to adjust to the Arm Rest Chair which secures the hold. I love my Arm Chair Caddy. A must for all those who love to kick up there feet after a hard days work or even if you are a Coach Potatoe this is the best resolution to keep yourself organized as well. I'm a crafter and it holds most of my tools while I sit in my chair. It's great! I like it because it holds so much. My cell phone, home phone, calendar, paper and pencil, stuff I need on hand. Unique idea. I love it. I put this on a brown recliner with wide rounded fabric arms. It fits perfectly and is very secure. I use it to hold a mug of coffee, tv remote, and pencils on the tray. This would work well on a sofa or chair with wide padded arms; it might slip on leather and wouldn't fit furniture with skinny arms. After reading reviews, I decided to take a chance. LOVE IT! This works well on loungers with big, fat armrests. I was amazed at all the pockets! I sew & crochet and always has a lot of things I have to use. The best part of the design is the "tabs" to hold it to the armrest. Now all my items are in one place and not on the floor! The only thing I did to make it better for sewing was to attach my pin cushion to the tray. Using long, straight pins, it was easy to attach to the tray. Since the tray is covered with cloth, it's easy to pin items on to it. Great price, too. To hold my remote and drink. A perfect size with ample pockets. The material is heavy . As a side pocket on my chair to hold remotes, kindles , glasses etc. Love it on my chair and is very useful. Had one just like it for years. Finally wore it out. Works well for my needs. It was used as a gift and the recipient was happy to receive it and we saw it in use! Thank you! It's perfect for limited space when you need a place to put your drink, books, etc. Was quite stiff at start then worked out. I use it on the end of my sofa. This would be perfect if the back of the box was not there so you can rest your arm in comfort without it hanging over the box end. I bought two of these and one I gave away as a gift and the other is still in the package until I can figure out what to use it for. I don't walk to well so I spend a lot of time on my couch and this is do convinent for me it hold all the thing I need every day so my table is not cluttered up next to me, and I don't have to get up and down getting the things I need. Helps keep things I use often right at hand. Very nice. Love the firm top tray. Husband loves it. Works for remotes and other stuff he likes to keep close while watching TV and while on his Surface. After reading reviews I was hesitant to purchase but decided to anyway. I love it. It's nice to have so many daily things at my fingertips. It has several pockets for scissors, pens, paper, remotes, papers, etc. Caddy tray top did not fit my armchair. I cut the tray off and glued down the excess material One side of this is perfect holding my TV Guide and three remotes. The other side I tuck into the armchair to strengthen it. Found that "tray" is too wide for arms of either the couch or recliner chair. Will hold remote or book, but not good for fluids or plate of anything. Needs to have some "redesign". This product is not usable in our household. The item would be great if the design included a double side velcro to make it stay in place if furniture arm is not an ideal fit. This was really disappointing. It is not well made and it is virutally useless to us because it doesn't fit over our couch arm even though our couch arm looks very much like the one in the ad. 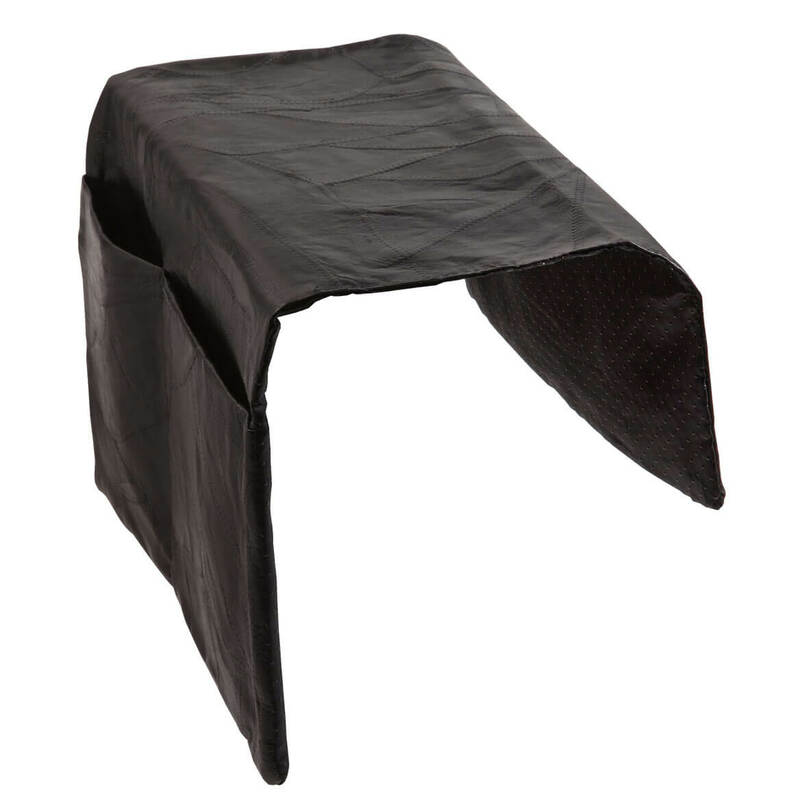 Idea is great, but material on sides is' very rough and course, is sharp on seams that rub arms when sitting in chair. Should Have Returned It!!! I like to have things I use often to be at hand. I don' t like retrieving them the floor when they keep falling. Needs something to stabilize it on the chair arm. This item reeked to high heaven when I opened it, and I had to put it out in the garage. Several days later it still smelled so I sprayed it with Febreeze and am hoping for the best. Tried it on chair briefly. The pockets are quite deep on both sides and on inside this makes them too long so they catch and pull the tray askew when you move recliner up and down. My recliner is smallish so this might not be a problem if you have a large overstuffed one. I don't like the tray on top as it is made from a hard material that is extremely uncomfortable when you are just trying to relax your arm on the arm of the chair. The arm on my chair is too wide for this product. I wanted something that would make my reading chair more comfortable. Unfortunately., the tray had exposed wires that scratched and punched a hole in my leather reading chair. It was sent back! I wanted to be able to keep small items closeby, but this thing doesn't hold, has a tendency to pop out some items, has a stiff top that tips over the items on it, is very ugly as well. Need I say more? they're going back. Not to mention the long, long delay in getting the order. Calls to you said no order was placed. Huh? I cut the tray off. I would never trust it to hold a cup of liquid safely. It just got in my way. This product is very misleading. It is not user friendly if you were to spill something on it. It does not stay on the chair arm/very unstable. Looks very useful to be able store cell phone, TV remote and set down a drink all at the same time. Convenient to keep everything nice and handy. I have one myself and love it! It offers so much storage! I want one for my friend in assisted living. looks like something I can use for my remote controls. I hope to use it on a chair as shown. the one that I have is bending. I just thought it looked like something I could use and keep all my items neat. I bought one for my husbands chair and Love it!!! Thought my mother would like it. I need something to organize all the gadgets and necessities I use when relaxing or watching TV. Thought it worth a try as it looked handy. It’s like a tiny table top right where I need one. THE TOP CAME OFF OF IT,OTHER THAN IT WAS EXCELLANT. my husband saw it and wanted it. He liked the pockets for remotes etc. So I will be less likely to spill drinks while watching TV! Looks like it might work for me. I have been needing something like this. Christmas present for my boyfriend. It appears convenient and handy. Looks like it will be perfect for all the stuff I gather around me when I'm sitting in my recliner. I am recovering from hip replacement surgery, and it will be so handy to have it all right at hand. BEST ANSWER: Thank you for your question. This Armchair Caddy is only available in the color advertised, brown. How can I order these. Please tell me what to do. can you wash it in your washer or remove the tray section? 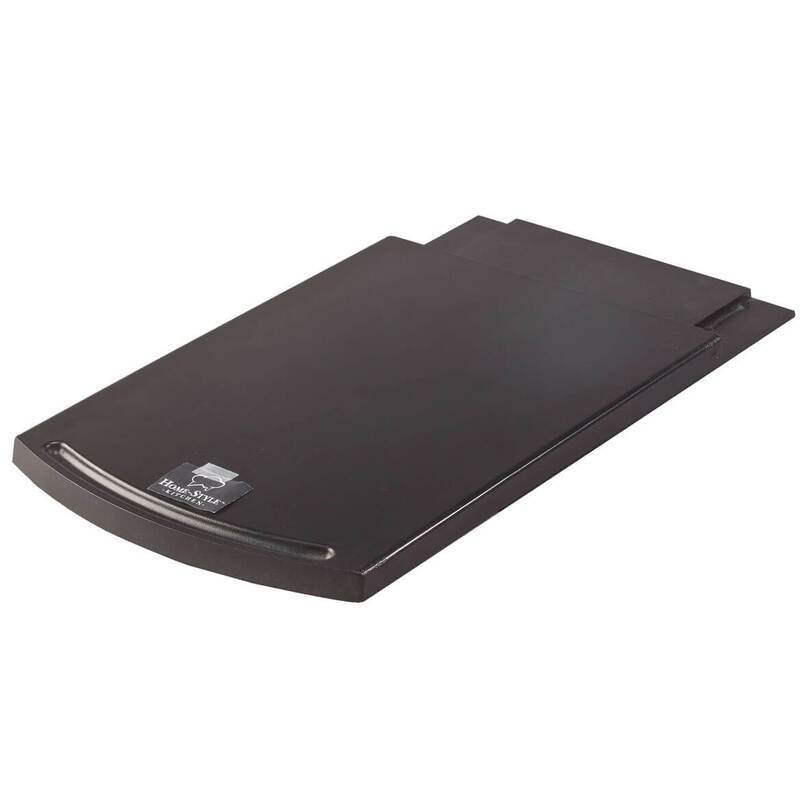 BEST ANSWER: The tray section does not detach, but the bottom of the tray comes out. It is a sturdy but thin wood, and the same wood is used for the framing of the tray. Spot cleaning would avoid damaging the wood. However, I think a hand washing would be possible and effective for the pockets if you keep the tray area out of the water because the wood would absorb water. The tray bottom could be recovered easily. The tray bottom fabric is glued on, not sewn. I find mine very handy, but I kept knocking it off the arm of my chair. It has a self-forming adaptation underneath to help hold it on a chair arm, but it did not help much for mine. I loved having so many separated pockets, however, so I found another solution. The chair I use it on is cloth covered versus vinyl or leather. I used old-fashioned upholstery twisst pins to hold it on, and I ordered them from this WDrake website. I placed the pins only on the inside part of the chair arm. I used two at the top on each side and two on the bottom, plus one or two at other more central locations. I used multiple pins in case one or two slip out and I don't notice them quickly. It works great. I've used it for several weeks with no more drops to the floor. The fabric is sturdy and well-sewn. The fabric-covered wood tray frame is joined at the corners by only the fabric, so the tray is a bit more comfortable for an arm to rest on it than it would have been if the tray were less flexible. I would not trust a cup on the tray even if the cup had a lid. I also would not recommend putting uncovered food, such as a sandwich not in a bag or wrapping, on it. Thank you for your question. This is spot clean only.We hope this information will be of help to you. The tray can not be removed. I vacume it and wash by hand. It is handy. I like it. Have u any armchair caddies in burgundy? BEST ANSWER: Thank you for your question. Unfortunately, we do not carry these in burgundy. We hope this information will be of help to you. Does the table top come off? BEST ANSWER: No, but why would you want it to? The whole thing lifts on and off easily. No . I've had mine for over a year and it hasn't come off. No. It's all 1 piece. is the top tray a hard solid material or a piece of cardboard? BEST ANSWER: I use mine everyday. It helps to keep some of my stuff altogether. The top is very sturdy. I would say the top is hard solid material. I got two of them and gave one to a friend. will it work on leather ? Yes it works on leather. BEST ANSWER: Yes, the tray is included. The armchair caddy does not fit all chair arms and the material is a bit scratchy to your arms when you sit in the chair. Yes. It's actually all one piece. Will this fit on a cloth recliner and stay put? BEST ANSWER: Thank you for your question. Yes, there are flaps of chair organizer help secure it in place. We hope this information will be of help to you. Stores in Houston, tx that sell organizers? BEST ANSWER: Thank you for your question. We do not have stores. We are only online and by catalog. We hope this information will be of help to you. What are the actual dimensions? The ad shows 11"L X 5 1/2" W X 3/4"H.
BEST ANSWER: Thank you for your question. The tray is 11" L x 5 1/2" W x 3/4". One side flap measures 7 ½” x 12” from edge to edge and the other measures 8 ¼” x 12” from edge to edge. We hope this information will be of help to you. can you fit a magazine in pocker? BEST ANSWER: Thank you for your question. the pocket is not big enough for a magazine. We apologize for any inconvenience.